From time to time, I sell used guitar parts on eBay, because my son is a luthier. Recently, I got some bad feedback, and when I checked on the buyer’s ratings, it seems that this guy (Mike in Nebraska) has a tendency to leave such feedback and after he gets a refund, he leaves new feedback saying, “Thanks for the refund.” The item I sold was a used (yep, used) truss rod cover. I asked $6.50 (with free shipping) for this used item, and Mr. Mike offered $5, which I took, even though it was hardly worth the trouble of doing the transaction. BTW, I offer 14 day returns, too. So, I package up the used cover, buy shipping with tracking ($2.05) and take it to the post office. Some 45 days after the transaction, Mr. Mike isn’t happy. I have offered a refund, but only if he returns the item. Mr. Mike hasn’t yet done the return request, perhaps because he knows that the item isn’t in such poor shape that it is worth printing out the form and paying return shipping. Actually, I will still give a full refund, despite it being 45 days, because it will be worth $5 to see if that cover looks as bad as he says. I know it was quite usable when it left me! Anyway, if you sell stuff on eBay, don’t sell to Mr. Mike. (eBay ID available upon request.) If there is a lesson in this, read the buyer reviews, and if he/she/it gives negative feedback or refers to refunds, cancel the order! Anyway, this is my first bad experience, but no doubt not my last. Here is an interesting article on how to scam eBay sellers: I’m dealing with a bad eBay buyer! My local library doesn’t have an available copy of Harper Lee’s new/old Go Set a Watchman available just yet, so I chose a novel that I first learned about when taking a graduate level course in improving reading in secondary schools, Mockingbird by Kathryn Erskine. The premise in this YA novel is that our narrator, Caitlyn, is a fifth-grader with Asperger’s Syndrome. I have a family member with a similar diagnosis, so this novel interests me on more than one level. Caitlyn had been quite dependent on an older brother, Devon, but he is not with her any longer. For anyone who does not know, the vast majority of symptoms of Asperger’s are associated with communications skills. Caitlyn exhibits many of the classic symptoms, but there is both humor and pathos in her approach to life. Her father seems to want to help her and connect with her, but he is suffering from a different malady. As the exposition unfolds, the reader learns that Devon was killed in a school shooting and their mother died of cancer a couple of years prior to the events of the novel. So the father is reeling emotionally, and Caitlyn is struggling with adjusting to these losses and with trying to develop empathy for other people. Other players in this novel include young Caitlyn’s teacher, counselor, and her fellow students. Try as she might, Caitlyn has trouble “getting” what others seem to understand with little trouble. This, too, is typical for Aspies. 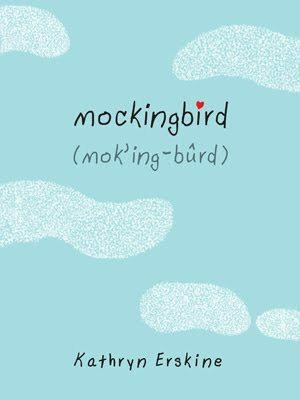 Mockingbird derives its title from the many references to the movie/book To Kill a Mockingbird, and I do not believe that the novel would resonate nearly as well if the reader had not either seen TKAM or read it. But, with most readers knowing a bit about the famous story by Harper Lee, it is fairly safe to say that most readers will “get” the references. Indeed, I really, really enjoyed the novel, but I did need some tissue toward the end— it is that kind of story. Reading YA lit is more and more common these days, because big publishing is far more open to publishing those stories. Getting a contract is rather difficult for new writers of adult fiction, but YA sells well, so it is becoming a crowded field. I don’t want to spoil it for potential readers, but I do want to encourage fans of TKAM to read Mockingbird. Although it could be read by upper elementary on up, it is a touching story for readers of any age. As I write this, bookstores and online book vendors are getting ready to sell something unusual. After sixty years of mostly silence, the “missing” manuscript, Go Set a Watchman, that Harper Lee wrote before she wrote her masterpiece, To Kill a Mockingbird, will be officially on sale on Tuesday, July 14, 2015. Some will love it, because Lee wrote it, some will hate it, because it isn’t just like To Kill a Mockingbird, and many people won’t care, because they don’t read. I don’t know if I will like it or not, but since I read, eventually I will tackle it. Part of the mystery is why publish this manuscript, and why do it now? Let’s go back some sixty years. Nelle Harper Lee, daughter of a lawyer in Monroeville, Alabama, dropped out of law school to focus on her writing. Her daddy wasn’t pleased and told her that she could now support herself. So she worked days booking airline flights and wrote in her spare time. Then, friends gave her sufficient funds to work on her writing full time for a year, so she quit her job and focused on writing. 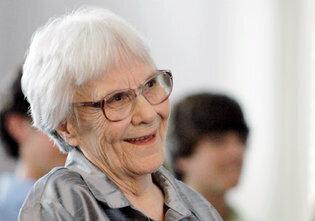 In 1957, Nelle Harper Lee won a contract for her debut novel, Go Set a Watchman. Lee’s editor of the time suggested that Lee go back and rewrite the book, focusing on the events which were told in flashbacks. Having spent a year on GSAW, I’m sure Lee had mixed feelings about this more than a rewrite, but new authors have to trust experienced editors, so Lee went back and worked for two more years. The result her her labors was To Kill a Mockingbird, which was instantly successful, being selected for various book clubs. Lee won the Pulitzer Prize for fiction and the excellent movie version of the book added to the fame (and fortune) of this lady from a very small town in Alabama. Not much has been published about Nelle Harper Lee, largely because she seemed unprepared for the trappings of fame which accompanied the publication of To Kill a Mockingbird. Not long after the movie’s successful run, she became a literary recluse; not granting any interviews. She kept up with her friends, but she did not want to talk about her now very famous novel. While I am certainly not famous, and don’t expect to be, I do get it. Really. My least favorite part of being a writer is answering all of the “why” questions which come from readers. For whatever reasons, many readers can’t let the work speak for itself, so they want more and more from the author. (I’ve always thought that Stephen King’s Misery is a backlash against obsessed readers.) Apparently, Ms. Lee was also not confident in her other work, so she didn’t finish her other projects after TKAM, nor did she make any efforts to have the first manuscript, Go Set a Watchman, published. Apparently, she was content to split time between her apartment in New York City and her home in Alabama. In 2007, Ms. Lee had a stroke; she already had severe hearing loss and macular degeneration. Her older sister, Alice, an attorney, had handled many of Lee’s financial affairs, but the Lee sisters both relied upon her literary agent to handle much of the business side of publishing, especially collecting the considerable royalties from the ever popular novel. Alice Lee’s own health began to fail her when she was in her nineties, so, increasingly, people less loyal to Nelle have had greater access to her and to her finances. Without going into detail, the copyright to TKAM has changed hands a couple of times, law suits have been filed against various parties over the rights, and over rights to merchandise bearing the name of the famous novel, and a considerable amount of greed has been part of the landscape. Finally, a judge did rule Ms. Lee, who is now confined to an assisted living facility, competent to make the decision to publish this long “lost” work, and it will be available for purchase. Based on pre-sells, it is already sure to be a bestseller. Fifty years from now, scholars will be writing papers on this matter. By all accounts, Ms. Lee had forty years of good health and good mind, and during that time, she did not seek to publish the previous manuscript. So the question is, did Harper Lee, who did not have much confidence in her later work, want readers to see this early manuscript? Or is it being published to fatten the wallets of the “handlers” of the elderly and failing Harper Lee? That’s why this is a literary and legal mystery.